Avery Kent knows that life can change in an instant: one second you’re on your way out of small-town life, the next you’re left heartbroken and stunned when your thrill-seeking high school boyfriend runs off in pursuit of a potentially dangerous dream. Four years later, everything is different. When Chase returns, admitting he made a mistake and asking for a second chance, Avery wants to think she can trust him again. But when the arrival of a handsome, quiet stranger named Fox shifts Avery’s focus, she realizes that things are about to get a lot more complicated. When is a lot of history enough reason for a future? And how do you ignore the way someone makes you feel, especially when they were the last thing you ever expected? Everyone knows that both Taylor (@taylorreads) and I are really annoying and pushy when we read a book we really like. 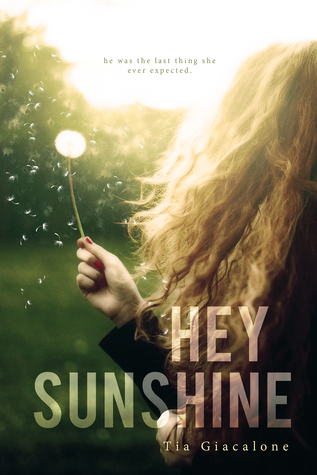 Well, Taylor read Hey Sunshine a few months ago by Tia Giacalone and she has not shut up about it. That being said, at some point during her rants in trying to convince me that this is the next big thing, she sent me a copy. And the first thing I thought was wow, okay this cover is gorgeous. This needs to be read. So I’m sitting on the plane, prepping for a long flight home and I realize I tossed it into my carry on. Little did I know the whirlwind that was about to ensue. I was hooked from page one. Honestly, I was immediately sucked into the lives of these complex and unique characters that truly made you feel for them with every page. Giacalone has an incredible writing style that just flows flawlessly, and I could not get enough. Let’s just say by the end of the flight I was halfway done with the book, and couldn’t wait to get home so I could keep reading. These characters were so realistic and sassy and lovable that I just wanted to be apart of their journey. I never, for one second, found myself questioning the motives of these characters and realized quickly how much I could relate. The way this book seamlessly flowed made me not even realize I was flipping pages as fast as I was – next thing I knew I had 20 pages left! I giggled, I cried, I fell a little bit more in love with my own boyfriend in real life, and I thanked my lucky stars for Taylor for sending me a copy. This book is the definition of what Independent Publishing is all about and I’m so blown away by this novel, I already have the sequel on order and it should be arriving in 2 days! That epilogue had me needing more, and I’m so excited to have it arrive! Everyone needs to read this, like, yesterday.